If you’re struggling to tolerate milk or prefer to avoid dairy, there are a number of alternatives to choose from. Here is the low-down on each alternative. It is important to note that alternatives vary considerably in nutrient content so look for brands that are fortified with added calcium and vitamins D and B12. Dairy milk is packed with micronutrients including calcium, iodine, riboflavin and vitamin B12 and fortification will not cover all this, in particular iodine which is essential for thyroid health. You will need to find other sources in your diet or look to supplement. Pregnant and breastfeeding women should seek advice from a professional on this. Many brands are sweetened; non-sweetened would be healthier. Most alternatives are very low in protein so you will need to look to receive this from other sources in your diet. Almond milk is made by combining 2 percent of almonds with water and sweetener. With such a low nut content it does not have the same nutritious benefits as eating raw almonds such as fibre and good fats. It is a good source of vitamin E, is one of the lowest-calorie alternatives available being low in fat and sugar. It’s mild in flavour and easy to digest. Coconut milk is made from the white flesh of brown coconuts and water. It most resembles the texture of cow’s milk and is good for cooking and baking. It is allergy free and contains four times more potassium than cow’s milk. It is very high in saturated fat, low in calcium and very low in protein (only 1%) and carbohydrate making it the lowest of all alternatives. Hemp milk is made by blending hulled hemp seeds with water, sweeteners and a little salt. It is a good source of Omega-3 and Omega-6 fatty acids and contains more iron than cow’s milk. It is allergy-free. It is a good option for vegetarians and vegans as it contains complete amino acids. If you avoid sweetened varieties thin it’s also low in carbohydrates. It is low in calcium so look for a brand that fortified with calcium and vitamin D2. Check labels for sugar content. Oat milk is made by milling oats with water then enzymes are added to break down the oat starch into sugars. Manufacturers often add gums and oils to improve its watery texture. It contains the soluble fibre and beta-glucan which can help to lower cholesterol. It is low in protein and fat and high in carbohydrate making it higher in calories than other milk alternatives. Rice milk is made by milling brown rice with water and enzymes are added to break the starch into sugars. It often contains thickeners to improve the texture. 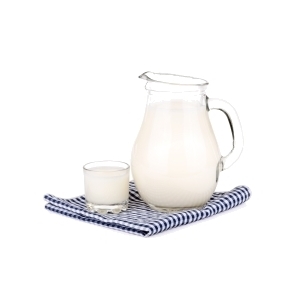 It is the most hypoallergenic of milk alternative, being free from nuts, gluten and soy. It is very low in protein and calcium and high in carbohydrates (three times as much as other alternatives) and fat as some brands add a small amount of sunflower oil. It is also thin and watery so not great for cooking or baking. It is not advised for infants, toddlers or pregnant women. You can make it yourself by blending one cups of cooked rice with four cups of water, then straining. Soy milk is made by either processing soybeans or with soy protein isolate. Nutritionally, this is the best non-dairy alternative to milk. It is equivalent to cow’s milk in protein and fat content. It also contains the best range of complete amino acids. If you look for unsweetened brands then it is very low in sugar, carbohydrate and calories. Brands are usually fortified with calcium, vitamins A and D.
The downside is that soy is highly processed and often contains thickeners and vegetable oils to improve the taste. The safety of soy milk is controversial. It naturally contains isoflavones, a type of phytoestrogen which mimic the effects of oestrogen. This makes it unsuitable for men and children and women with hormone irregularities and hormone- cancers. It can often cause allergic reactions. Despite its nutritional content I would not recommend it.